This post comes courtesy of the American Dental Association's Mouth Healthy blog. The original article can be found here. Enjoy! Teething can be a very stressful time for parents between fussy daytime hours and restless nights. For better or for worse, it is a necessary, natural and healthy process of childhood development. Babies have twenty primary teeth that start coming in at about 6-12 months and finish at about three years of age. During this time, irritability, poor sleep, loss of appetite and increased drooling are common. Fever, rash and diarrhea are not normal signs and need to be evaluated by a pediatrician. 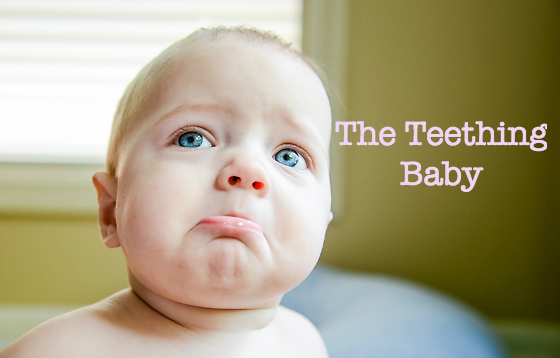 To sooth a teething baby, you might be tempted to try a anesthetic gel like Orajel or Orabase. These products may provide temporary relief, but pose a risk of inducing a rare but fatal condition known as methemoglobinemia. Rather, try gently rubbing your clean finger, a cold spoon or a piece of gauze over the irritated gums. You can also use a teething ring to alleviate some pain. This age range is a critical period for your child to become inoculated with decay causing bacteria, so make sure whatever you use is cleaned and not shared between family members or siblings. We know that caring for an infant is a true labor of love. If you ever have any questions about your child's dental needs, development or expectations, please give our office a call!